The San Francisco Bay is the largest estuary on the West Coast of North America. Its waters and wetlands extend to more than 40% of California! It includes some of the state’s most important ecosystems and habitats, housing endangered bird populations and over 1,000 species of animals. In the KIDS for the BAY Watershed Action Program, students are amazed to learn just how special and unique their local watershed is. Students at Amador Elementary School in Dublin were fascinated to learn that they are connected to the bay by local creeks and streams, like the interwoven threads in a spider’s web. “The bay is more than 20 miles away and we’re still in the same watershed!” shared Sid. Students performed hands-on experiments exploring estuary science and the various types of water in the bay. In the KIDS for the BAY “Estuary in a Bag” project, student groups mixed together saltwater and freshwater to see how they interact in an estuary. “It looks like the saltwater is sinking, while the freshwater stays on top,” observed Sohani. 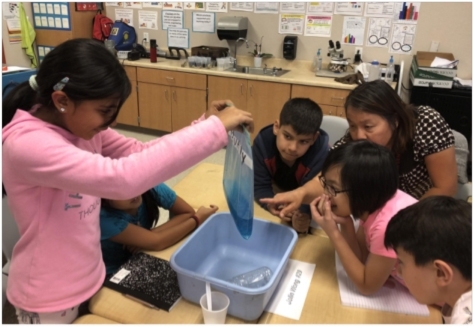 Students learned that saltwater in the San Francisco Bay sinks to the bottom of the bay because of its higher density. The null zone is a special area where saltwater and freshwater meet, creating a nutrient rich area where many unique species thrive. “Seeing the different types of water mixing in the bay is so cool. I never knew that this is what actually happens in our bay!” shared Kelly. Our fifth grade scientists are excited to continue learning about their watershed this school year. Stay tuned to hear more about their journey exploring their local environment!